« Question of the Week: Are Americans Rational About Risk, or a Bunch of “Paranoid Nuts”? The most important, powerful, and relevant argument against the value-added tax in the short run is that we can balance the budget in just five years by capping spending so it grows at the rate of inflation, a very modest level of fiscal restraint. The most important, powerful, and relevant argument against the value-added tax in the long run is that more than 100 percent of America’s long-term fiscal problem is too much spending. And now Europeans are doubling down on that failed approach, thus confirming that politicians will rarely make necessary spending reforms if they think more revenue can be squeezed from taxpayers. Here’s a chart taken from the recent European Commission report on taxation trends in the EU. 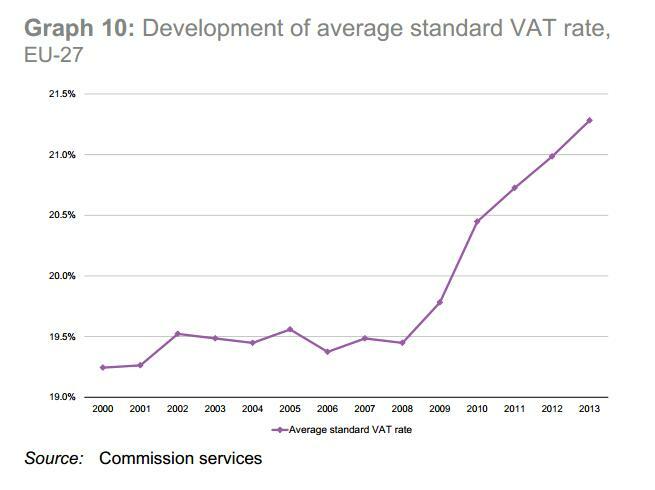 As you can see, the average VAT rate in Europe has jumped by nearly 2 percentage points in just five years. As I explained last week, European politicians also have been increasing income tax rates, so taxpayers are getting punished when they earn their income and they’re getting punished when they spend their income. Which helps to explain why much of Europe is suffering from economic stagnation. Given the perverse incentives created by redistributionist fiscal policy, it makes more sense to climb in the wagon of government dependency. For more information, here’s my video that describes the VAT and explains why it’s a bad idea. *The same thing is now happening in Japan. P.S. I don’t know if you’ll want to laugh or cry, but the tax-free bureaucrats at the Organization for Economic Cooperation and Development actually argue that the VAT is good for jobs and growth. Good stuff and absolutely right. From a Brit perspective it was always interesting to me that in the mid-1970s, otherwise sound people in the think-tanks such as IEA and CPS were all up for VAT as it was seen as less destructive of growth than direct taxes on income. Indeed once of Mrs Thatcher’s first acts was to slash income tax rates while jacking up VAT. But of course, as with all taxes it was never ‘either/or’ and we end up with both income tax AND VAT, to say nothing of all the rest…! A VAT cannot be good for growth. An increase in the VAT increases prices across the board. Those with after-tax income must buy less or save less. Those who receive additional redistributed income through government also buy consumables at elevated prices. In the best case for the VAT, consumption decreases for income earners are offset by consumption increases by the dependent, with no change in growth. In every other case, savings must decrease, forcing a reduction in growth enhancing investment.